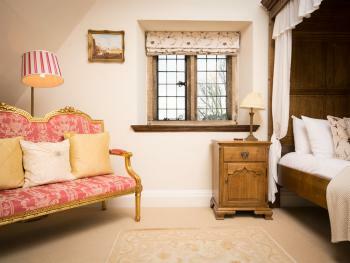 Our lovely Monet room named after the artist himself, is a standard king size room with a King size four poster bed. 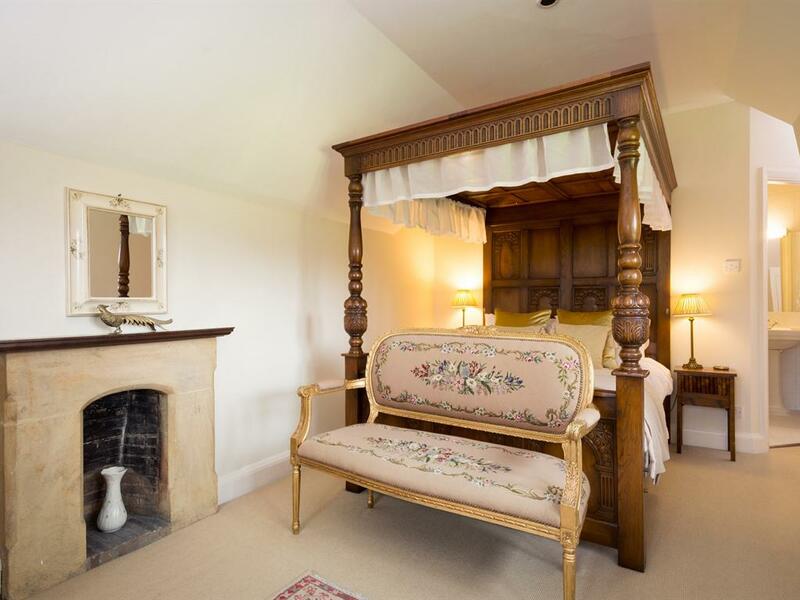 This bedroom has a Private bathroom (not en suite) just a few steps away with a large bath tub and old style hand held shower. Our Monet room over looks the rear gardens where in the summer you can see our fabulous rose gardens. 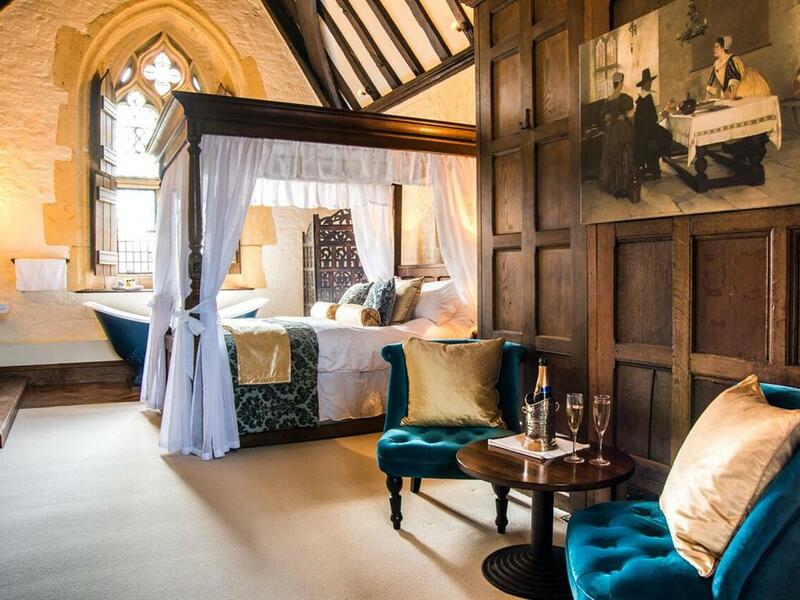 All bedrooms are equipped to a high standard with four poster beds, flat screen TV’s, and seating areas. Beds are dressed with the finest Egyptian cotton sheets to ensure a blissful nights sleep. Thick, fluffy white towels, bath robes and complimentary toiletries complete the en-suite bathrooms. 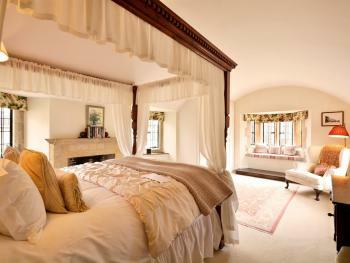 Our Sargent room named after the artist John Singer Sargent, is a Double room which boasts a Double four poster bed. The Sargent room has an en suite shower room and over looks the rear gardens where in the summer you can see our fabulous rose gardens. 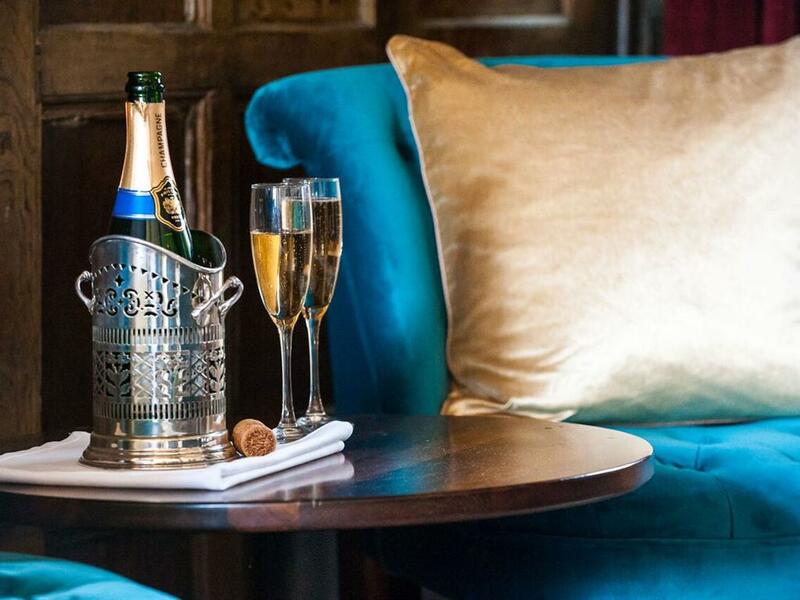 All bedrooms are equipped to a high standard with four poster beds, flat screen TV’s, and seating areas. Beds are dressed with the finest Egyptian cotton sheets to ensure a blissful nights sleep. Thick, fluffy white towels, bath robes and complimentary toiletries complete the en-suite bathrooms. Leading directly off the medieval Great Hall and up an ancient stone stairway, you will discover the beautiful Elizabethan Suite. 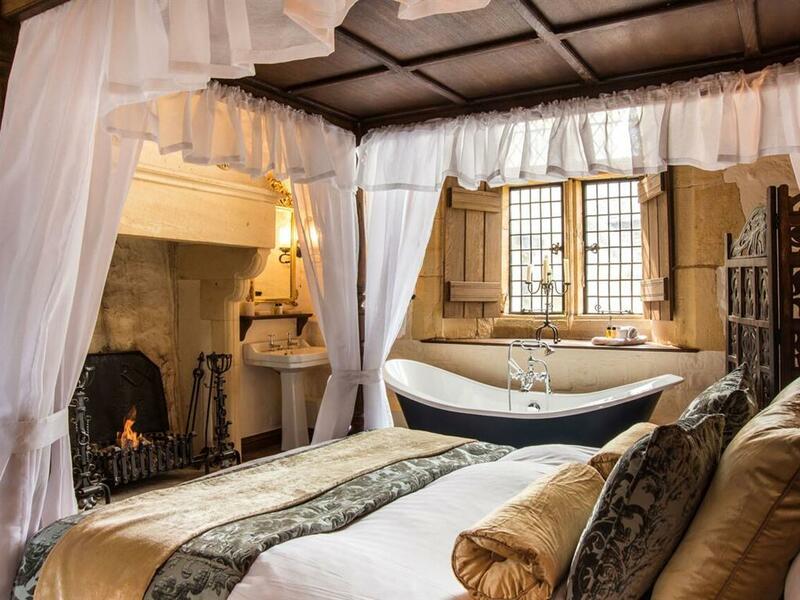 In a private area of the house, this has to be one of the most atmospheric and romantic suites in the Cotswolds. To be found in the very oldest part of Abbots Grange. 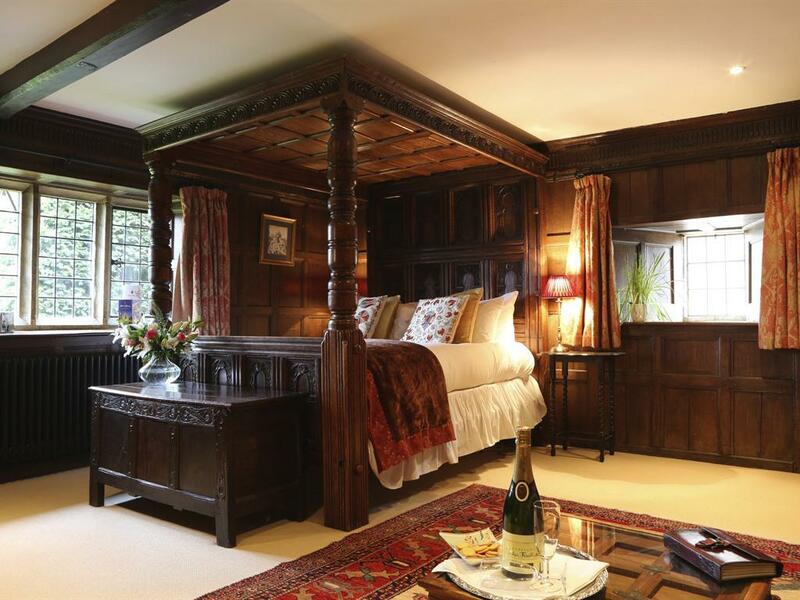 The ‘Elizabethan Parlour’ - a stunning, generously proportioned oak panelled bedroom with heavily carved oak four poster bed and glorious open fire. 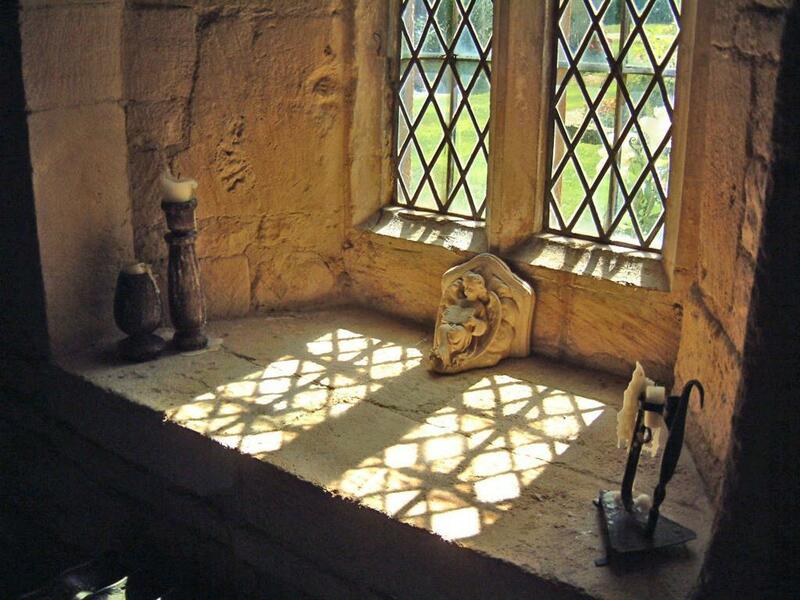 A private medieval ‘Oratory’ sitting room with traceried windows and circular trefoil window overlooking the Great Hall. Extensive and luxurious bathroom with wet room/walk-in shower, bath and dressing/wash room. 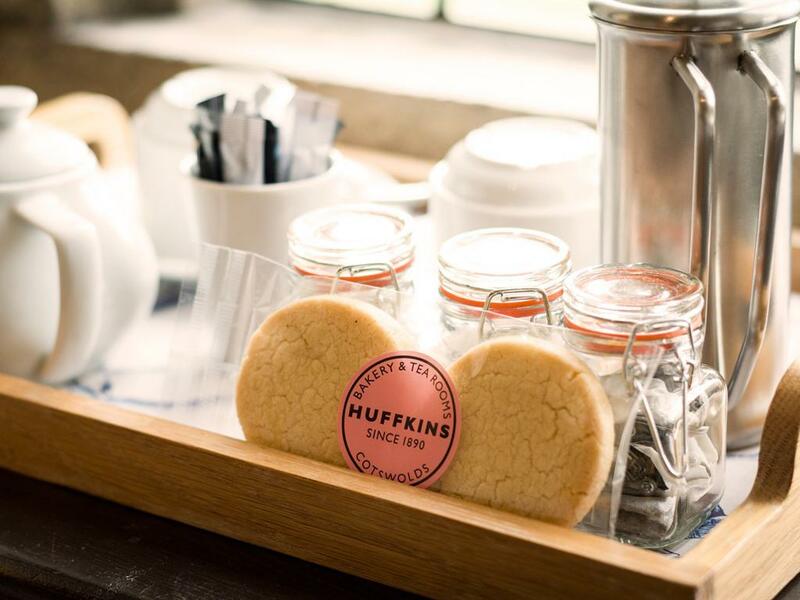 Through original leaded light windows unrestricted views out over the private gardens, croquet lawn and village of Broadway beyond. 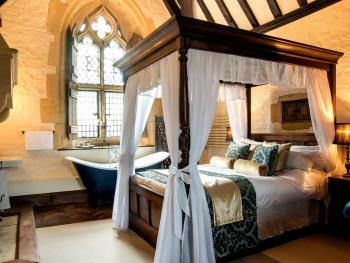 All bedrooms are equipped to a high standard with four poster beds, flat screen TV’s, and seating areas. Beds are dressed with the finest Egyptian cotton sheets to ensure a blissful nights sleep. 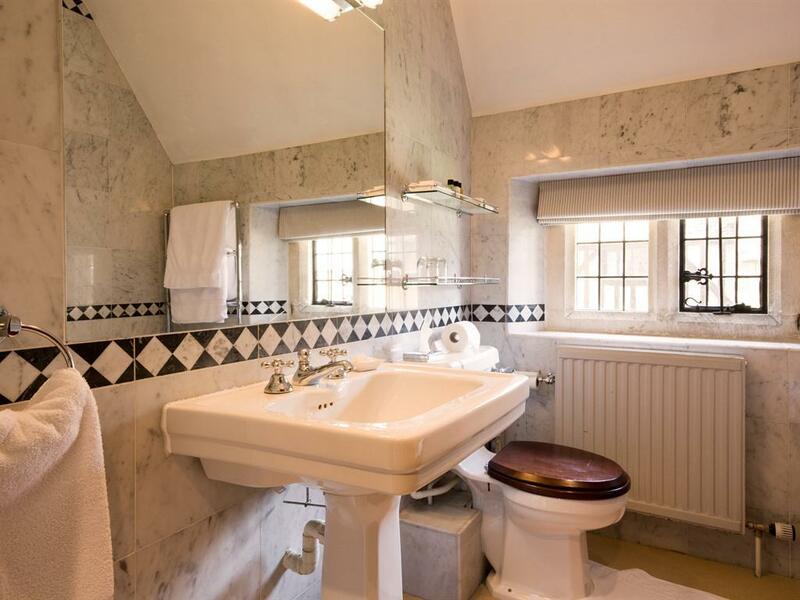 Thick, fluffy white towels, bath robes and complimentary toiletries complete the en-suite bathrooms. 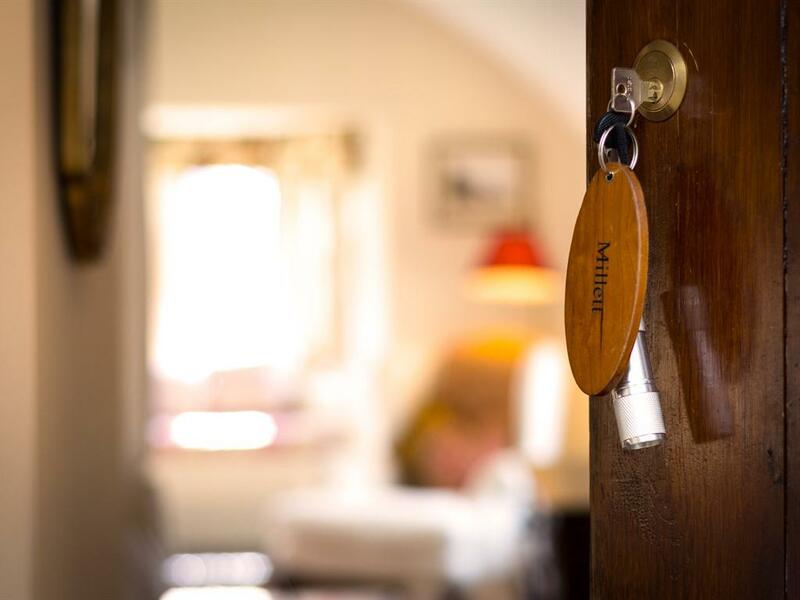 Our Millet room is named after the artist and former owner of Abbots Grange, Frank Millet. 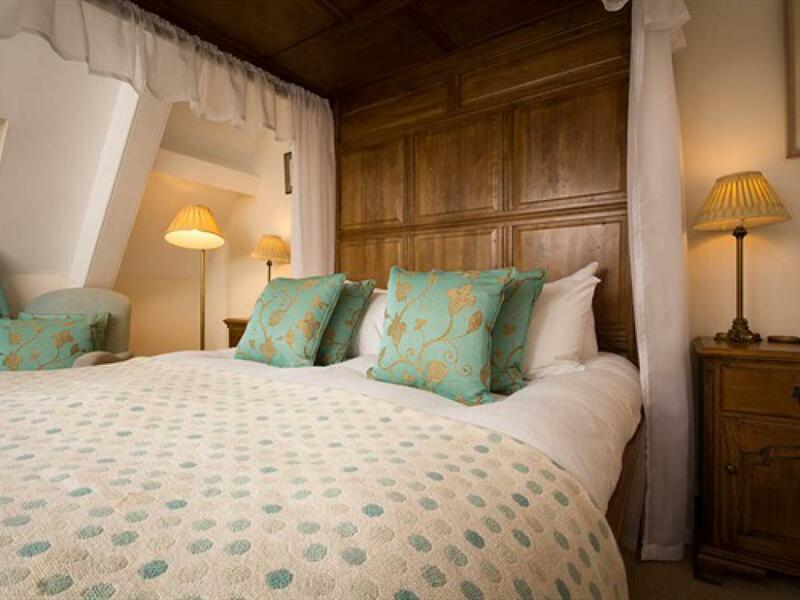 The Millet room is a King size bedroom and boasts a King size four poster bed. Millet has an en suite bathroom with bath and over head shower and looks out onto the front gardens where you will see the magnificent walnut trees. 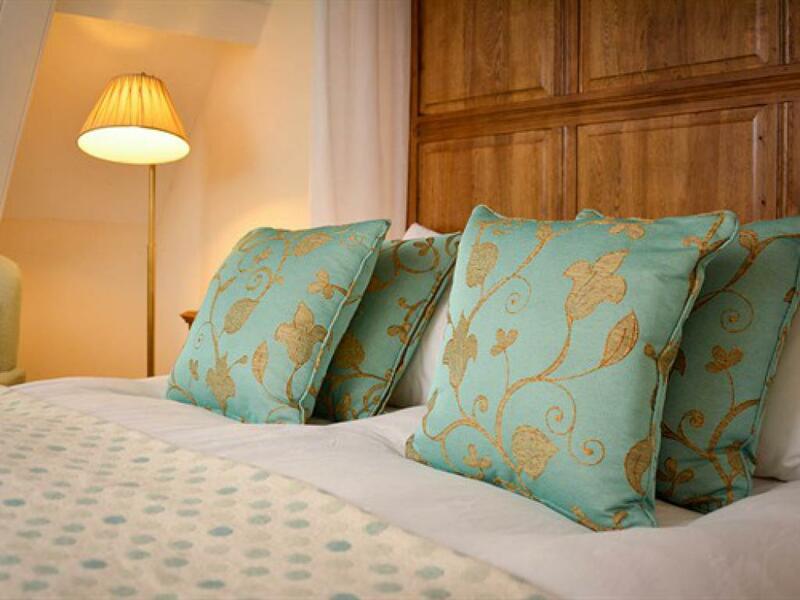 All bedrooms are equipped to a high standard with four poster beds, flat screen TV’s, and seating areas. Beds are dressed with the finest Egyptian cotton sheets to ensure a blissful nights sleep. Thick, fluffy white towels, bath robes and complimentary toiletries complete the en-suite bathrooms. 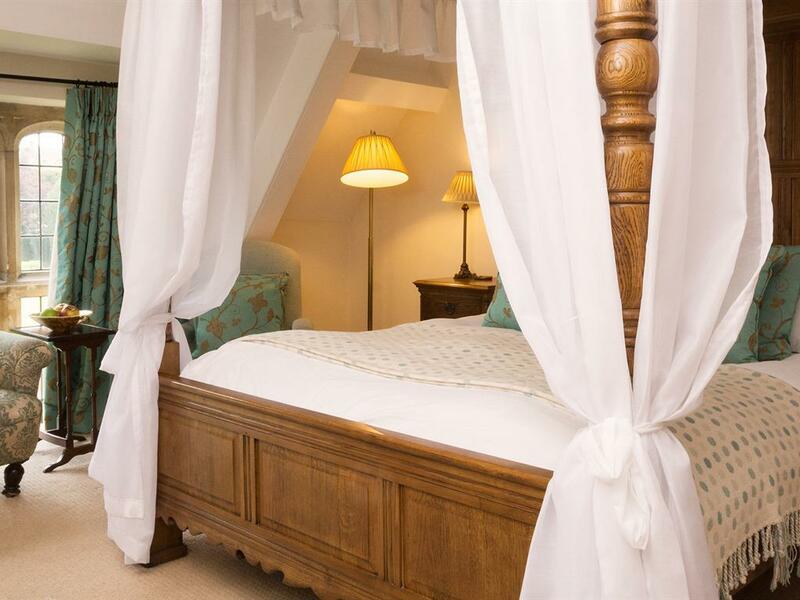 Our Morris room is named after the artist William Morris and is a King size room which boasts a King size four poster bed. The Morris room has an en suite walk in wet room with shower only. Morris over looks the front and side gardens, giving it a dual aspect of the wonderful rose gardens and superb walnut trees. 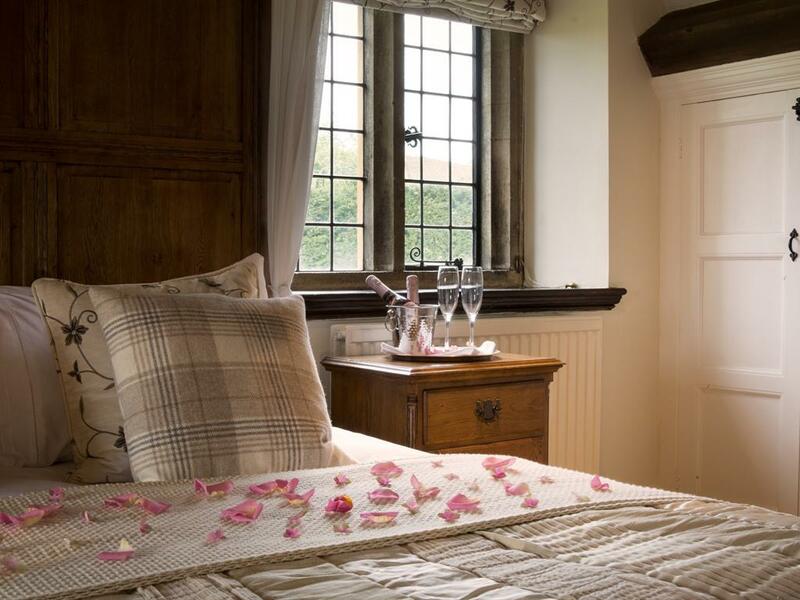 All bedrooms are equipped to a high standard with four poster beds, flat screen TV’s, and seating areas. Beds are dressed with the finest Egyptian cotton sheets to ensure a blissful nights sleep. 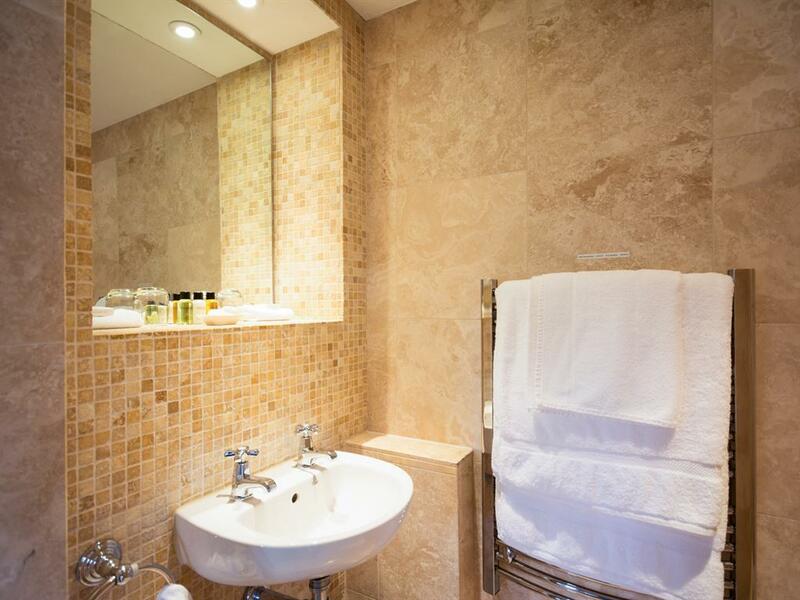 Thick, fluffy white towels, bath robes and complimentary toiletries complete the en-suite bathrooms. 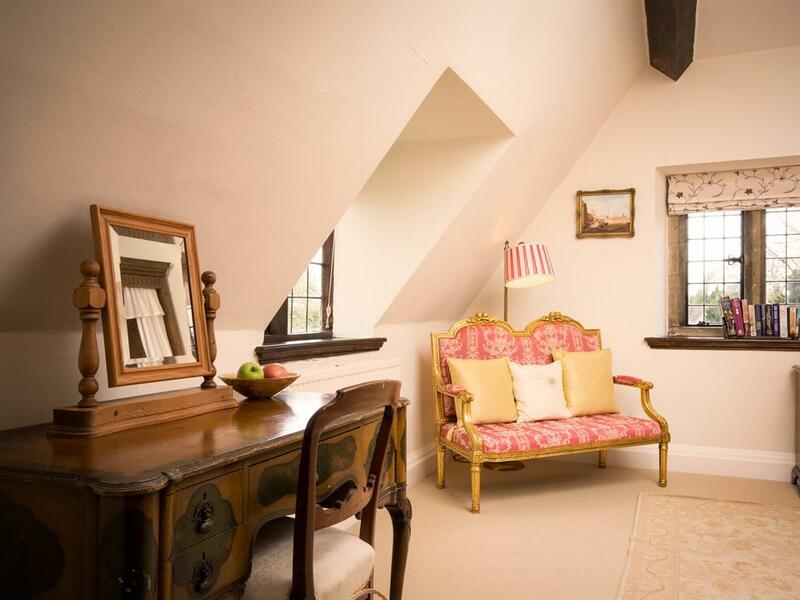 The Abbots chambers - a very generously proportioned (26sqm) room where spectacular monastic medieval architecture blends seamlessly with modern day comforts: Ancient stone stairway leading directly to the Abbots Chambers and oratory. King size carved oak four poster bed dressed with fine Egyptian cotton sheets. 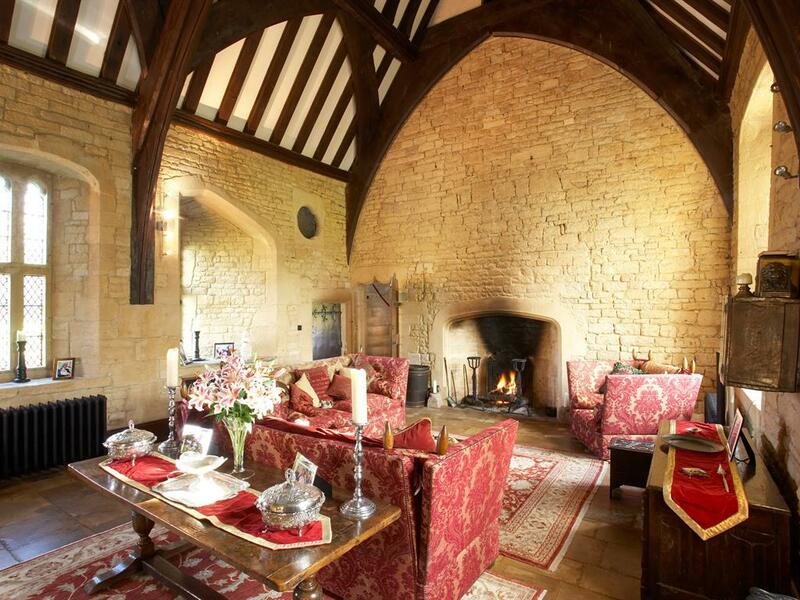 Feature Cotswold stone fireplace with real flame fire, seating area and flat screen television. 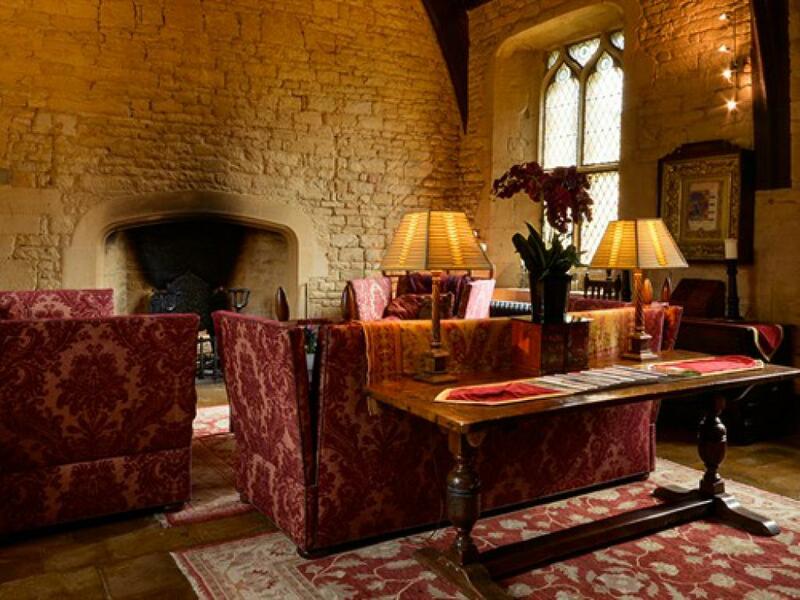 25ft vaulted oak timbered ceiling, oak panelling and mood lighting. Secret squint to the Great Hall. In-room bathing with splendid freestanding roll-top bath with hand shower. 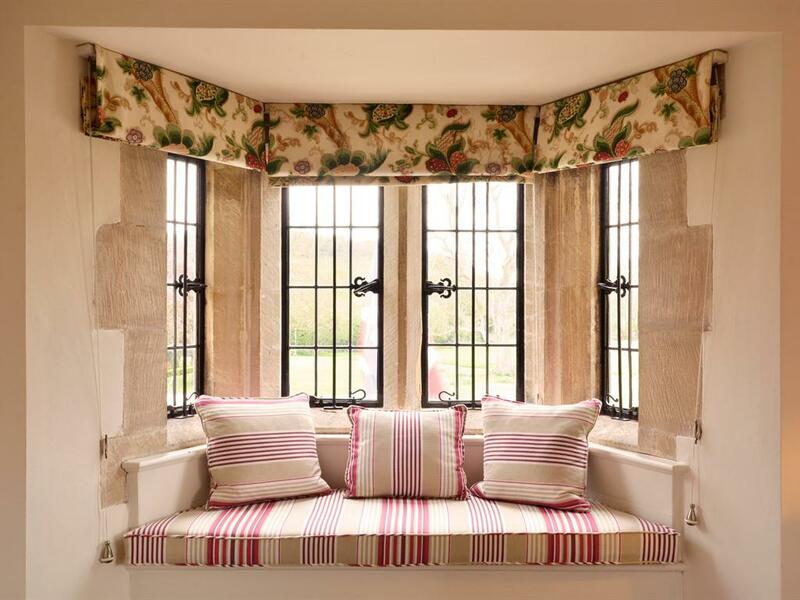 Feature trefoil, leaded light windows with views over the gardens and Cotswold hills beyond. 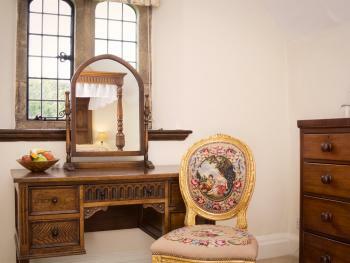 Furnished with beautiful fabrics, antique rugs, period furniture and artworks. All bedrooms are equipped to a high standard with four poster beds, flat screen TV’s, and seating areas. Beds are dressed with the finest Egyptian cotton sheets to ensure a blissful nights sleep. 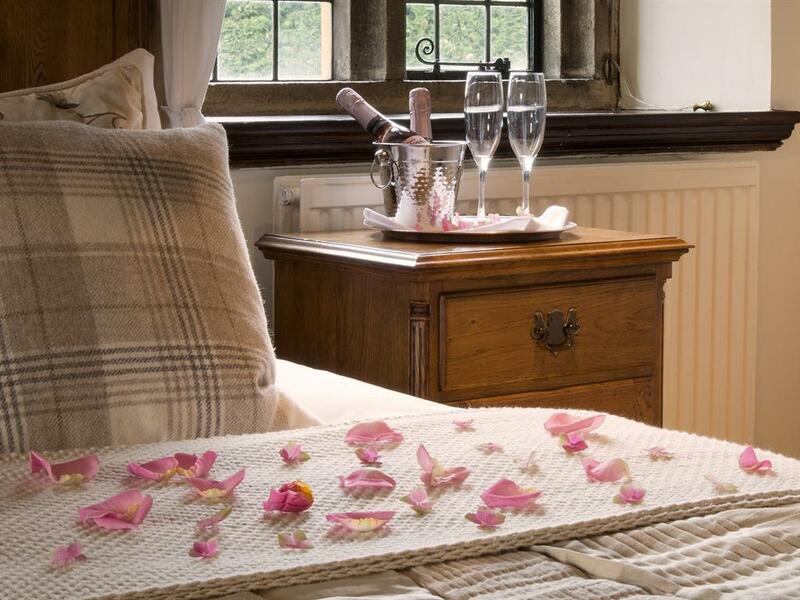 Thick, fluffy white towels, bath robes and complimentary toiletries complete the en-suite bathrooms. 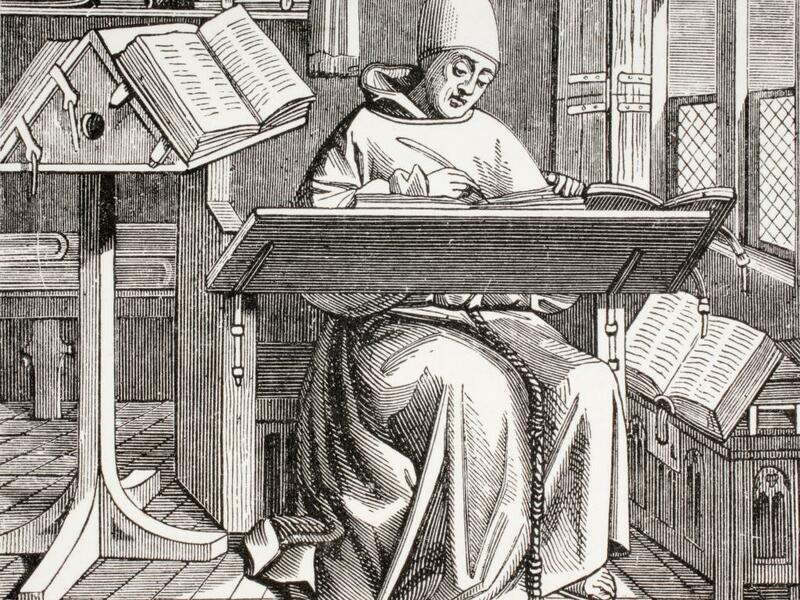 Formerly the Scriptorium and Sacristry, the Bishops Suite was where the monks worked on their manuscripts and intricately detailed illuminations. 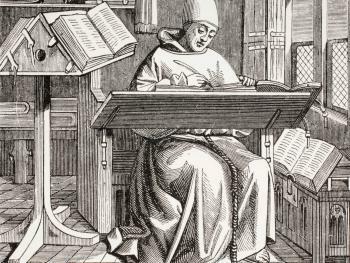 When not in use these magnificent works of art and other valuable religious objects were stored here. 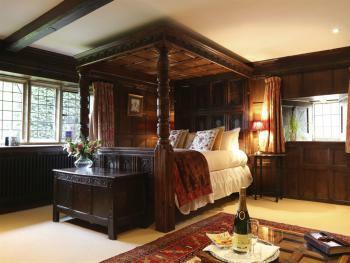 Situated on the ground floor in the medieval heart of the house these rooms and later parts comprise the Bishops Suite. A heavily timbered ceiling characterises the living room with huge open fireplace, original parquet floor and leaded light feature windows on three sides. With a dual aspect overlooking both front and rear gardens, the living room is set out with twin sofa fireside seating in one half and TV lounge in the other. You will also find the original priest hole repurposed as a luggage store. 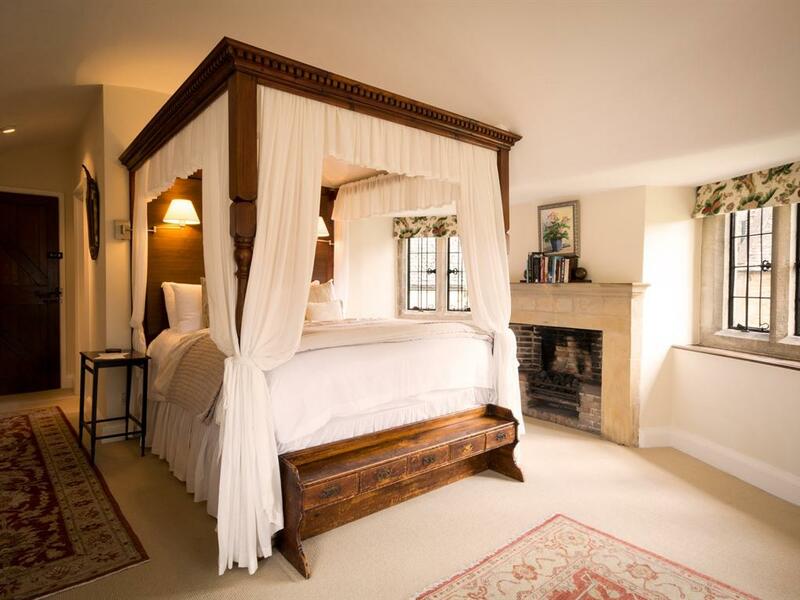 With a Cotswold stone open fire place and impressive English and Flemish antiques, the bedroom features a solid oak king size four poster bed draped in richly embroidered red and gold silks. 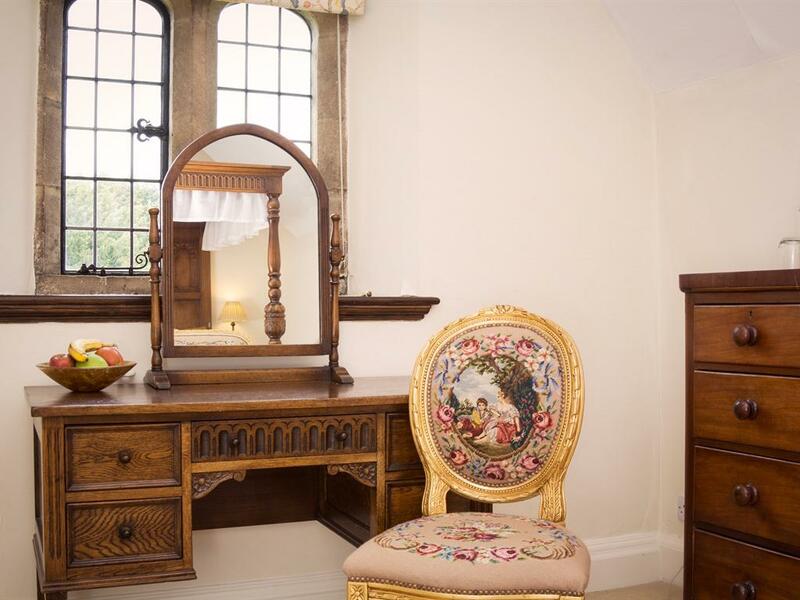 The ancient heraldic painted cupboard housed the Bishops personal effects and is now repurposed as a wardrobe. 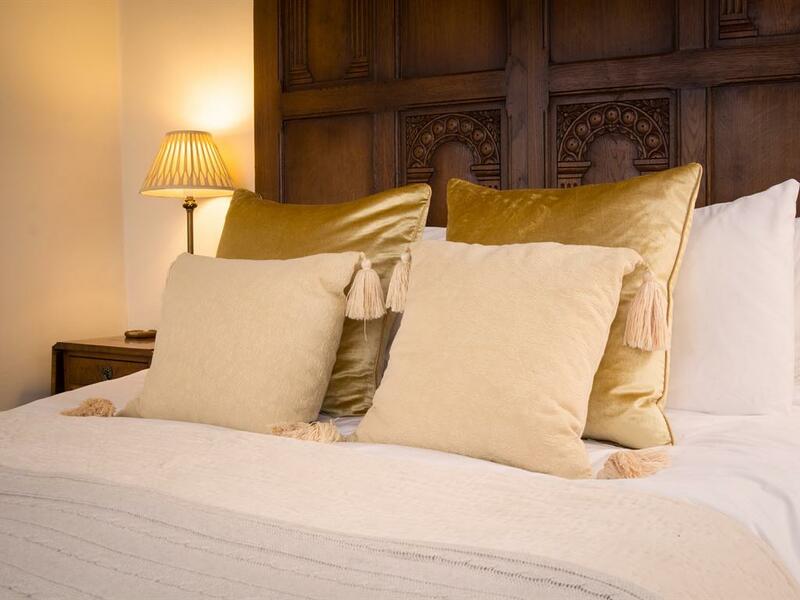 Your bed comes dressed in the finest white Egyptian cotton sheets to ensure a sound nights sleep. Modern en-suite bathing facilities with Italian Cararra marble and walk in wet room rain shower complete the spacious and thoughtfully designed bathroom. With its own private living room, impossibly romantic bedroom and ensuite facilities, the Bishops Suite is the most spacious accommodation at Abbots Grange. All bedrooms are equipped to a high standard with four poster beds, flat screen TV’s, and seating areas. Beds are dressed with the finest Egyptian cotton sheets to ensure a blissful nights sleep. 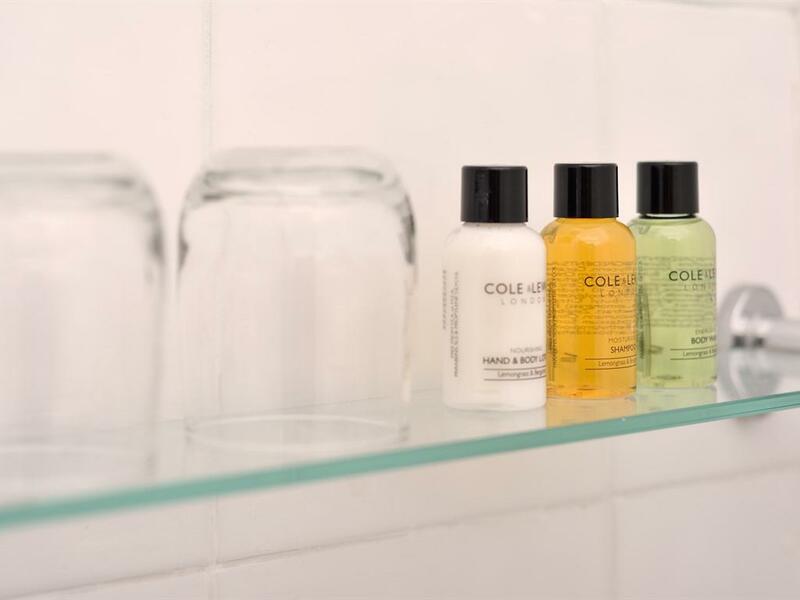 Thick, fluffy white towels, bath robes and complimentary toiletries complete the en-suite bathrooms. 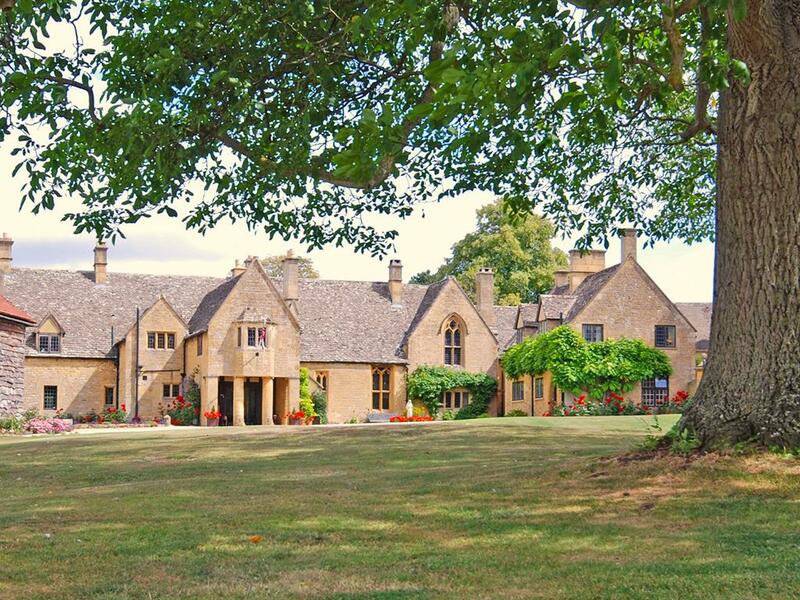 Winner of the 2017 eviivo 'UK Guest House of the Year Award' Abbots Grange is situated in the village of Broadway in the Cotswolds. 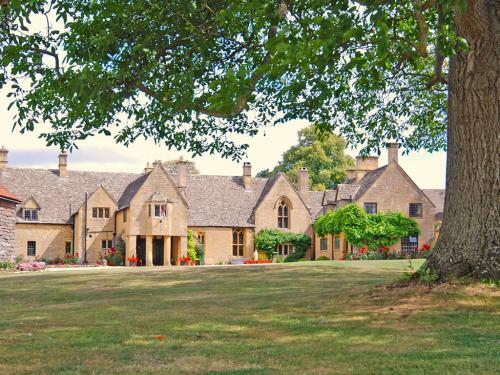 An AA 5 star adults only accommodation the manor house is set in over 8 acres of parkland and gardens with unrestricted views over the Cotswolds hills. 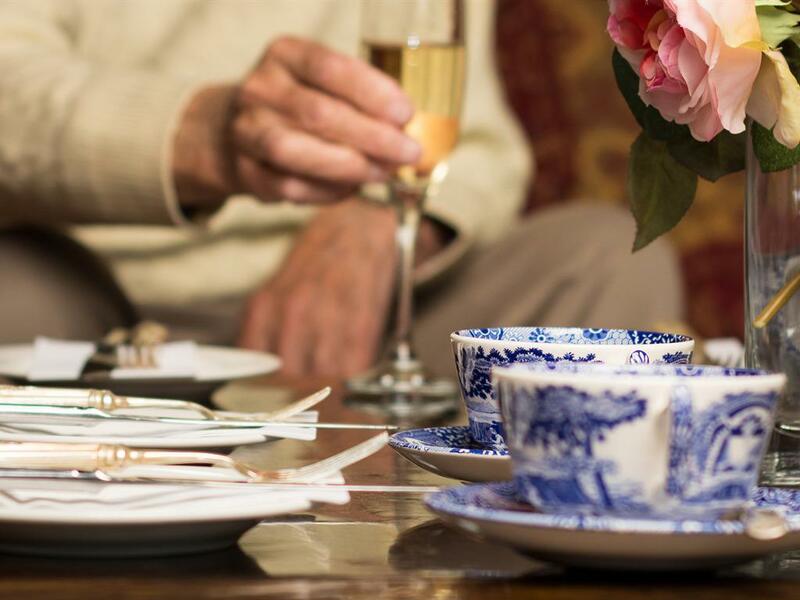 The Grange has a tennis court, croquet lawn, and helicopter landing pad together with rose gardens, summer house and outside seating areas. 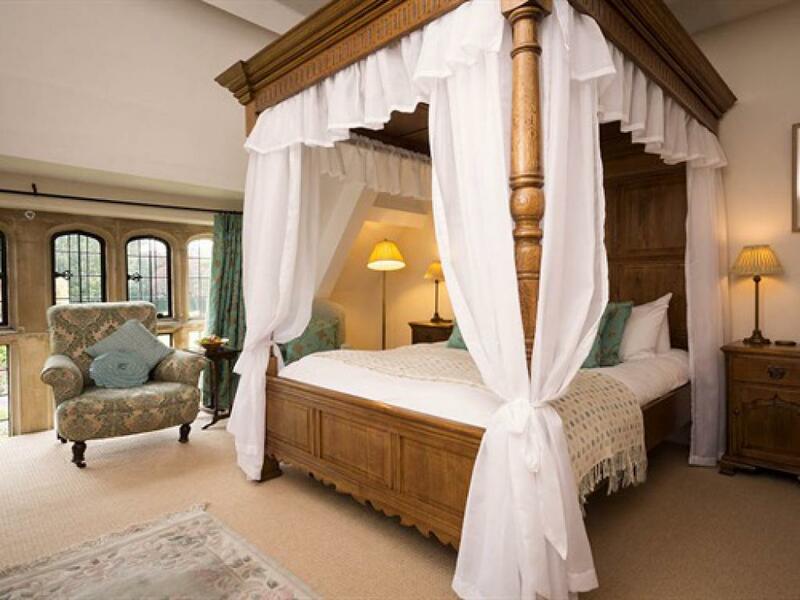 Dating back to 1320, the house features rooms and suits with four-poster beds with fine Egyptian cotton sheets, flat-screen TV's and seating areas. Bathrooms have thick fluffy white towels, bathrobes, slippers and complimentary toiletries. 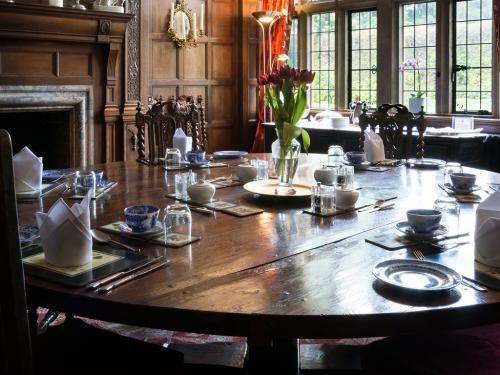 In the mornings, full English breakfast is served in the panelled dining room, along with a selection of fresh, seasonal fruit and seasonal berries. Dishes are prepared using locally sourced produce where possible. Vegetarian and lighter breakfast options are also available. 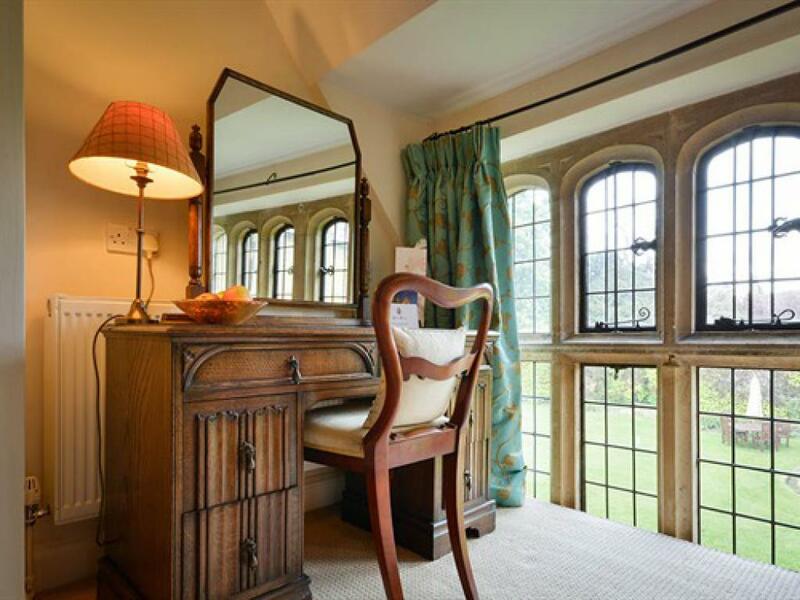 This medieval manor house is 2 minutes’ stroll from Broadway’s High Street, which has a selection of boutique shops, inns, and restaurants. Birmingham International Airport and Oxford city centre are both each 40 miles away. Free private parking is available at Abbots Grange. Abbots Grange lies in the heart of the village of Broadway. Abbots Grange lies in the heart of the village of Broadway. From the High Street, turn into Church Street. Approximately 50 yards on the right-hand side turn on to gravel driveway (signposted Cowley House). At the end of the gravel driveway you'll see the gates to Abbots Grange on your right.